Why doesn’t Amazon offer same-day delivery in Roxbury? Eleven months after its debut, Amazon’s same-day delivery service is available to nearly everyone in Greater Boston — everyone, that is, except for residents of three ZIP codes in predominantly black Roxbury. 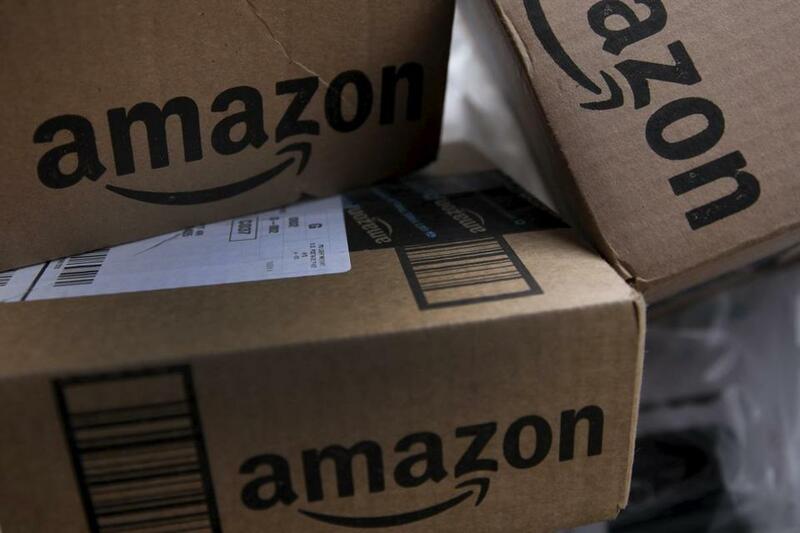 The service, available around Boston and in 26 other metropolitan areas, allows a customer with a $99-a-year Amazon Prime subscription to buy an item from the online retailer’s vast catalog in the morning and have it dropped on the doorstep by evening. But an analysis by Bloomberg found Amazon’s same-day delivery zones in Boston and several other cities conspicuously don’t include certain minority neighborhoods. The most striking example was Roxbury, a tiny island of exclusion surrounded by a sea of same-day delivery that extends even to distant suburbs near the New Hampshire border. Roxbury residents on Thursday expressed dismay, but not shock. They said Amazon’s decision to leave the neighborhood out is just another example of the second-class services they’ve come to expect from government and businesses. “If we are paying the same amount for the same products then we should get the same service,’’ she added. An Amazon executive told Bloomberg that Roxbury was “an anomaly.” In a separate statement to the Globe, the companydefended its practices, saying it considers customer data and delivery logistics, not demographics, when deciding where to launch same-day delivery service. He added that Amazon would continue expanding same-day service to other ZIP codes, but did not respond to questions about when or whether Roxbury would be added to the list. Meanwhile, the company is rumored to be gearing up for even faster one-hour deliveries around Boston by leasing a warehouse in Everett. Same-day delivery is available on total orders of $35 or more, though not for all products. 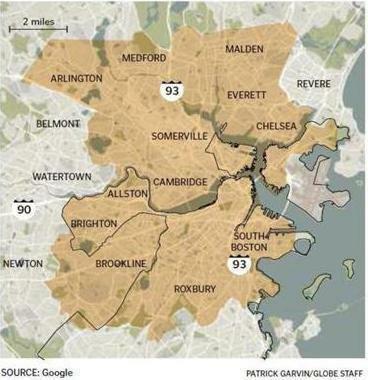 Amazon’s same-day delivery service does cover other neighborhoods with large minority populations, including parts of Mattapan, Dorchester, and East Boston. It also extends to majority-minority municipalities such as Chelsea and Lawrence. A Globe analysis of Census Bureau data found that the three ZIP codes excluded from same-day delivery by Amazon are among the poorest in Boston. Each has a median household income below $33,000, compared with $54,485 for all of Boston. All three have more nonwhite residents than white residents. However, the ZIP code with the highest proportion of black residents, in Mattapan, is include in the delivery zone. What unites the excluded areas, it appears, are low income levels. Former state treasurer Steven Grossman, now chief executive of the Roxbury nonprofit Initiative for a Competitive Inner City, said there’s no defending companies that crop out low-income areas. He called on residents to petition Amazon. But other business leaders stood by Amazon, saying the company is simply acting according to financial realities. 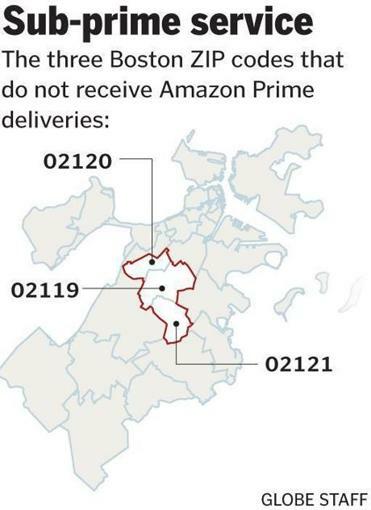 Amazon is not alone in carving out Boston neighborhoods from its delivery zone. A review in January by the Dorchester Reporter found that many trendy, on-demand companies offering convenient delivery of food and other services — including Caviar, Drizly, Favor, Instacart, and Postmates — don’t serve parts of Dorchester and Mattapan. Across the harbor in East Boston, similar companies have distributed fliers seeking delivery drivers, even though they don’t deliver to customers in the neighborhood. When Google launched its same-day service, dubbed Google Express in 2014, the initial delivery zone included Roxbury but cut out much of Dorchester. When Google launched its same-day service, dubbed Google Express, in 2014, the initial delivery zone included Roxbury but cut out much of Dorchester. The company has since expanded its delivery area to cover nearly all of Boston besides Logan Airport. Intentionally discriminatory practices such as red-lining — an array of racist policies by banks and other institutions in the 20th century that crippled economic development in minority urban neighborhoods — are largely outlawed today. But troubling disparities between Boston’s neighborhoods persist. Residents in parts of the city with large minority populations pay more rent relative to their incomes and face longer commutes to work than residents of other areas, for example. Community advocates in Boston have also decried so-called food deserts, or neighborhoods where it’s nearly impossible to find affordable, healthy groceries. And minority entrepreneurs in Roxbury say they lack equal access to startup accelerators and venture capital. In that context, residents said, it’s hard for them not to see Amazon’s exclusion of Roxbury as part of a pattern. can be reached at megan.woolhouse@globe.com.